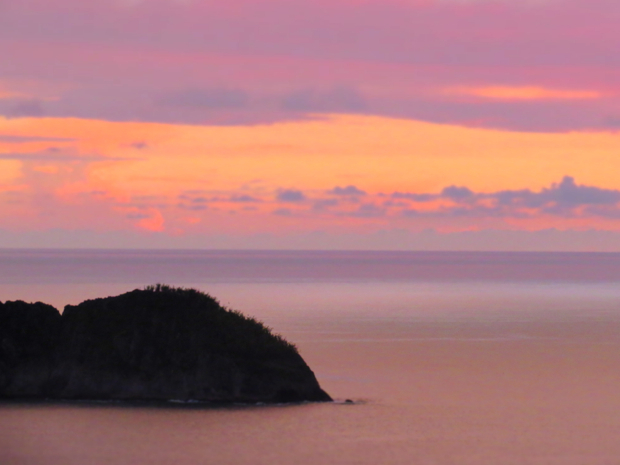 The hush of the blowing wind blankets the sea of terracotta mounds. With no civilization, no development, and no obstruction the wind sweeps the expansive desert with ease. It has the strength to lift the earth, liberating particles into a swirling breeze, and continue its weightless voyage. The Tuaregs move like the wind. 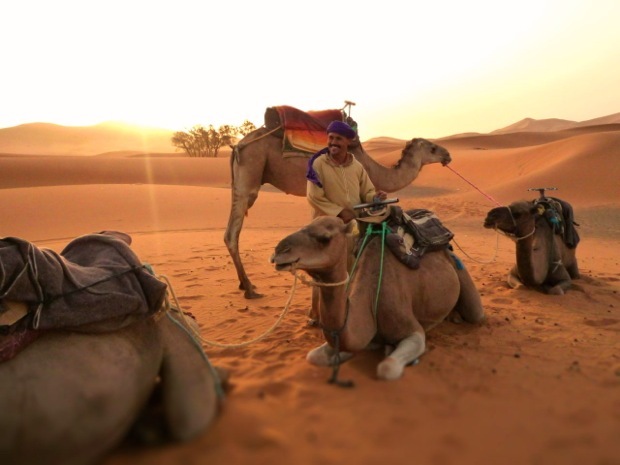 The Sahara is their home, its geography limitless. They glow against the warm fields of copper, wrapped in blue scarves for protection from evil spirits trapped in the desert’s infinity, crossing on camels to their impermanent dwellings. 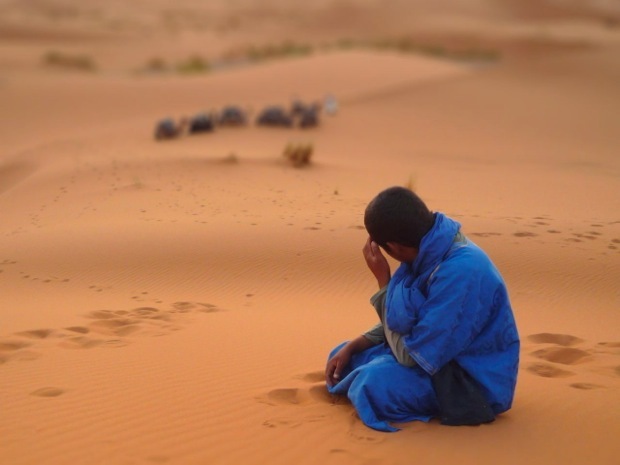 The rest of the world calls these indigenous nomads “Berbers”: the barbarians. They call themselves “Amajagh”: the free men. 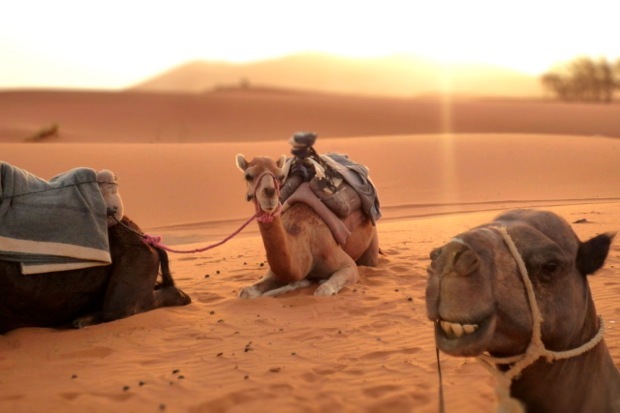 Every year tour companies across Morocco bring thousands of foreigners into the Sahara to ride atop camels and eat and sleep with the Tuaregs in their traditional tents. Last year I was one of them. This is my story. Our tour guide said with hesitation. 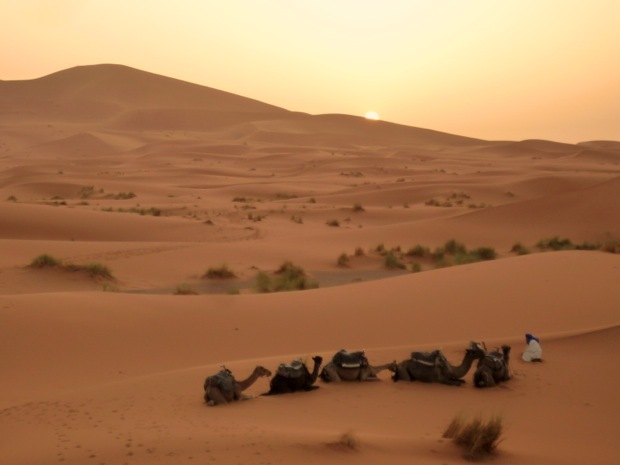 After two days of snaking through the high Atlas we had finally arrived in Merzouga, the entryway to the Sahara, to discover that there were not enough camels. 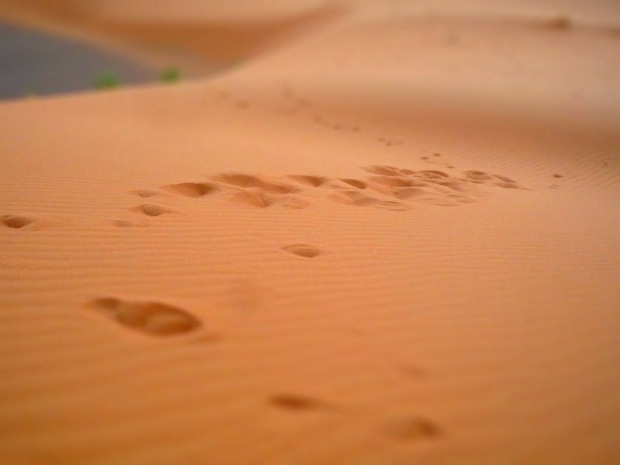 Since I arrived in Morocco two weeks before, I felt the desert beckoning me. I imagined myself overlooking its confectionery hills in a dramatically draped scarf billowing in the abrasive sand weighted wind. I imagined myself as a more feminine Lawrence of Arabia. The sun was setting and I struggled to contain my frustration over our late departure. We were short eight camels, which meant only half of the group could ride. The others would jeep across the rippled dunes like snowplows churning virgin snow. “It’s no problem, the ones who ride in the jeep today will take the camels tomorrow,” our guide assured. I felt like a child pouting from the unfulfilled promise of a bedtime story. 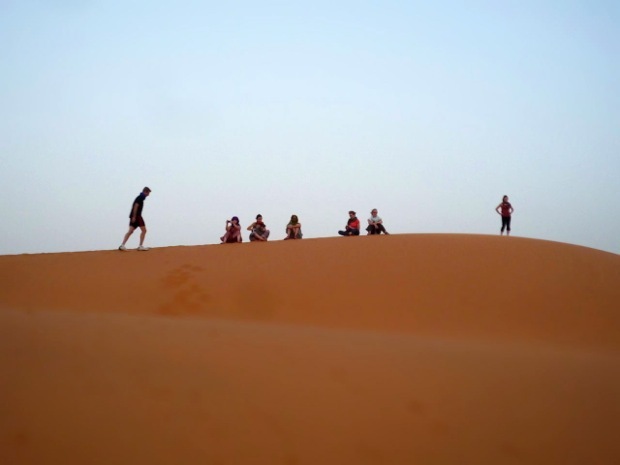 The teenage son in the British family had become violently ill that morning and spent our lunch and bathroom breaks en route to Merzouga expelling what little tagine was left in his stomach. He would be jeeping along with his mother. That left six. Other travelers offered to relinquish their camels. My own juvenile selfishness prevented me from saying a word. One jeep departed towards the turmeric hills and we continued our search for more volunteers. The glowing horizon was a prominent reminder of our impending deadline. 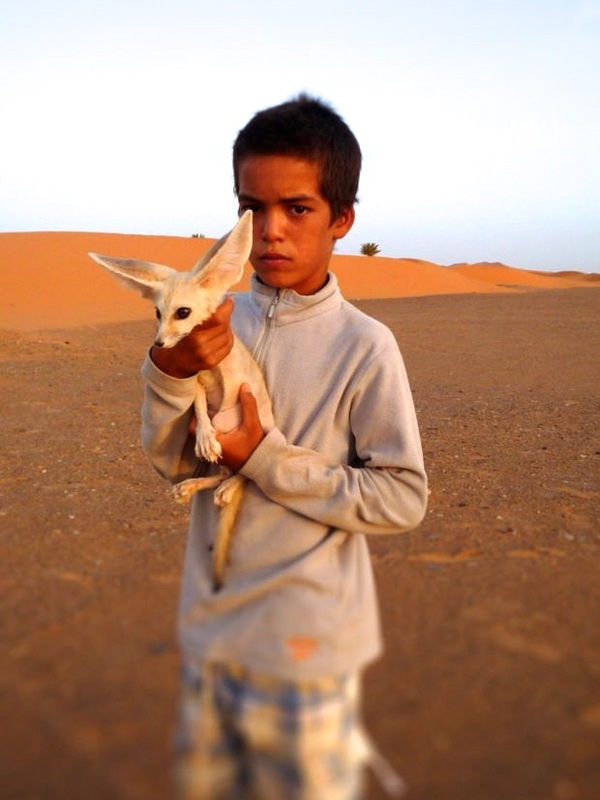 As the Saharan Tuaregs prepared the humpback creatures for our journey, the owner’s son passively entertained us with his beautiful desert fox and intense stare. He never spoke a word but his eyes expressed more than I could comprehend. I wondered if he abhorred interacting with tourists but stood there out of obligation. I wondered if he was deeply curious but too apprehensive to expose a smile. Lionel, the other American in the group, had been filming videos of himself using TRX suspension cables across Morocco. He wanted to perform the exercise suspended from a camel to demonstrate the versatility of the equipment. 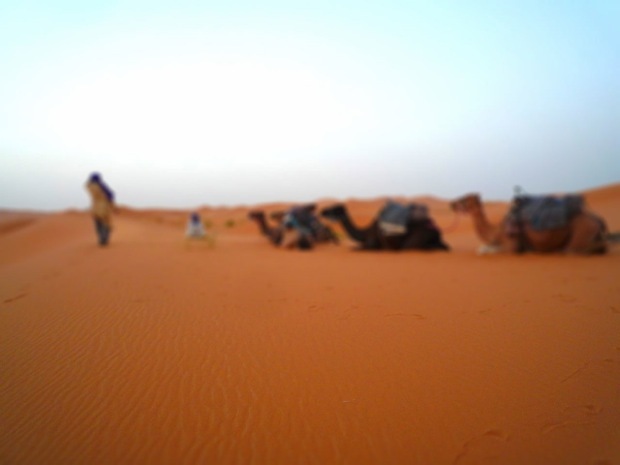 The Tuaregs agreed to this for the following day, when we returned to Merzouga. I had the responsibility of filming it. My camel collapsed to his forearms with a theatrical thud inviting me to climb aboard. I wrapped my legs around his cavernous torso and gripped tightly to the handlebars. He extended his legs and I was propelled upwards with more momentum than I predicted. The ground appeared far below. With no straps or belts I felt vulnerable and unstable. We trotted in rows skimming the sand peaks in a world that felt light years from reality. 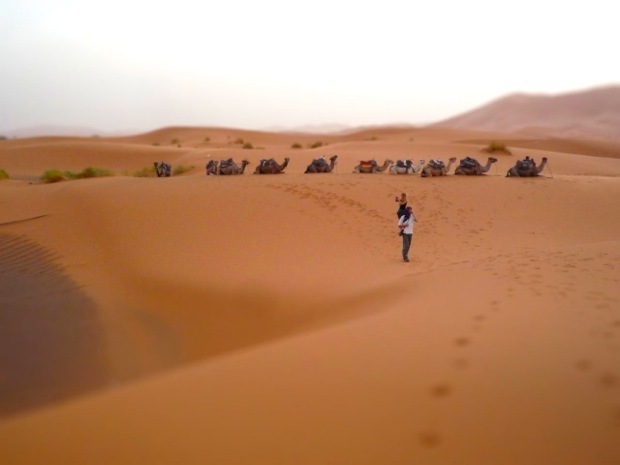 Had I actually been in Marrakech with mopeds, hagglers, and henna just two days before? Nothing felt real but the sound of the wind and the sensation of sand blowing against my skin. The sun settled behind the hills and the sky turned our surroundings blue. 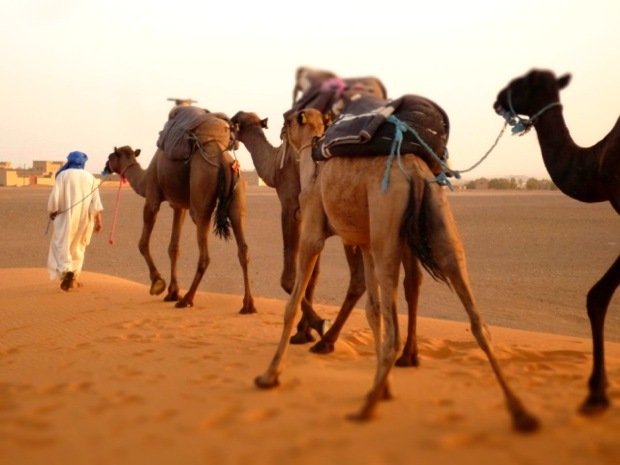 The Tuaregs immediately halted their gentle beasts and frantically searched their cargo bags for dates and cookies. It was sundown and the final day of Ramadan. They sunk into the cool sand and flooded their mouths with water between bites of dried fruit. I witnessed the incomprehensible dedication these men possessed to trek for days in the desert heat with no food or water. When we reached our tents the light of the sun had been swallowed by the dark enveloping sky. The moon and stars began to glow through the holes in its mantle. A blazing fire warmed the camp, which grew cool in the sun’s absence. We sat on stools around a wood table sharing tagine filled with lemon chicken, couscous, and vegetables. Two men dressed in blue tapped on animal skin drums and began to sing in their native Amajagh tongue. After dinner we chose our sleeping quarters. I was again reminded that I was alone. I awkwardly took the spare bed in a room with two girls from Amsterdam. Lionel stood next to the fire giving free bodywork to the other tent dwellers. One of the percussionists instructed we follow him outside of the tent, and without question we did. He led us up sand hills that exhausted my calves. He reached for my hand and gripped my finger as he trudged forward. It was one of those moments where I was passively participating in an experience I did not want to have. I allowed our hands to remain connected, concerned that I might offend him. Shortly after I found an excuse to drift away. When we reached the top of the dune the sky lit with innumerable stars like glitter spilled across sheets of black construction paper. We sat in silence and allowed the atmosphere to devour us. I stayed far from the percussionist. We returned to the tents with no awareness of the time, swept with exhaustion from travel. The tents insulated the summer heat in their four corners leading most of the travelers to sleep on a nearby dune under the stars. I felt uneasy at the thought of sleeping in a tent alone. I knew nothing of these men and their reservations. I honored my instincts and dragged my air mattress out of the tent and up the hill. “There’s a spot here,” the percussionist called to me, gesturing the sand next to his bed. I continued down the row as far from him as possible, ignoring his request. The wind blew furiously mocking my futile attempts to keep a sheet over my bed. I was in and out of consciousness throughout the night, chilled by the wind, disrupted by the sand, but I felt more secure next to my fellow travelers, in the open desert, than inside my warm protective tent. 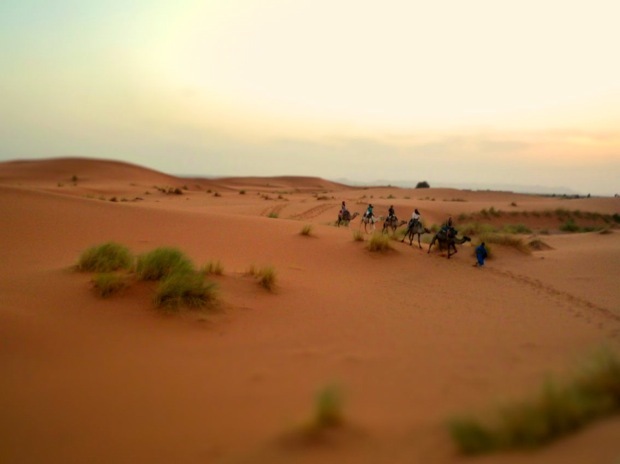 The Tuaregs shouted, “let’s go,” with the repetition of a metronome before the sun had even chosen to rise. “No yallah!” I grumbled back. I climbed down to my tent and packed my belongings with my eyes half open. It was four am. Within ten minutes we were on our camels. Somehow in the few hours that spanned between stargazing and excited shouting they had corralled eight more. Other Tuareg communities must have been nestled nearby hidden in the concealing heights of the dunes. My camel marched onward as I swayed in half consciousness. The moments where he descended down cliffs with a disconcerting lack of stability alerted me with the effectiveness of a cold shower. We stopped as the sun began to crest the hills in the center of the desert. I gazed beyond the endless pastures of arena. Sitting in the silence free from the words of others and free from my own thoughts I became one with the wind. I allowed its strength to lift me. I rode its weightless ease. Back in Merzougah Lionel handed me his camera to begin filming. 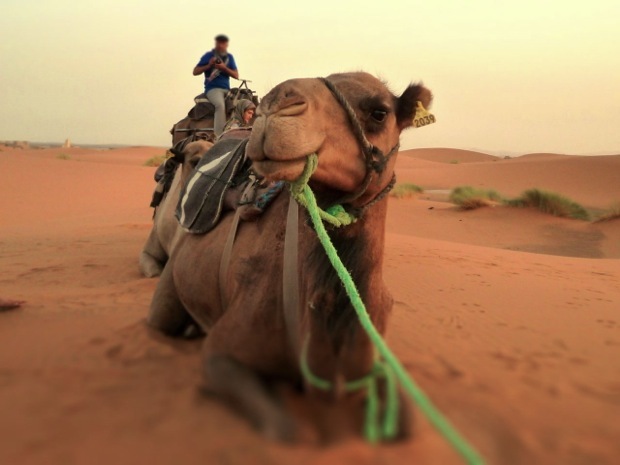 He strapped his TRX suspension cables to the camel’s saddle and prepared for his close up. Unfortunately the Tuaregs had misunderstood his request the day before. “We don’t want to harm the animals,” they said. Me and my camel in the Sahara. Beautifully written, Camille! This made me feel very connected to the desert. 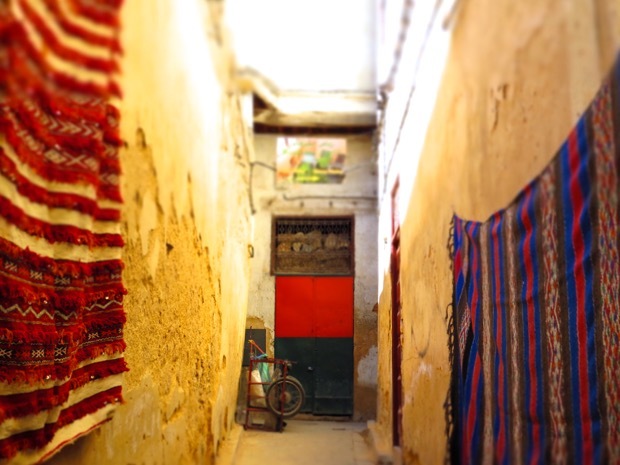 Morocco is so beautiful with so many hidden corners. 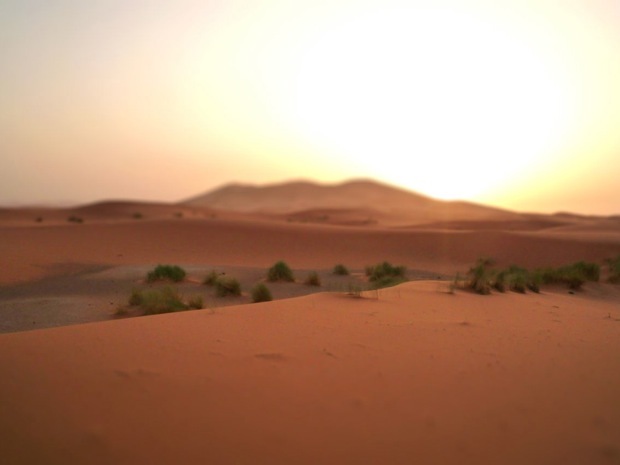 But you are right that the Sahara is the highlight of any Morocco tour. Hi! I was wondering with what tour group you made the journey to the desert? 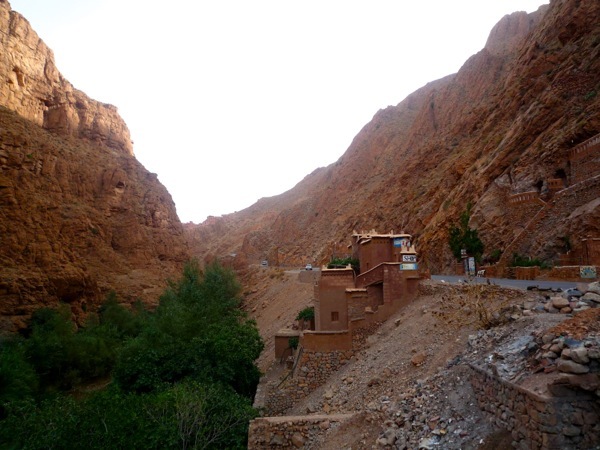 I’m going to be traveling alone to Morocco and I want to do the desert part as part of a group, but I’ve already contacted various companies and most only offer private tours or group tours if you have the group already. What you did sounds ideal.